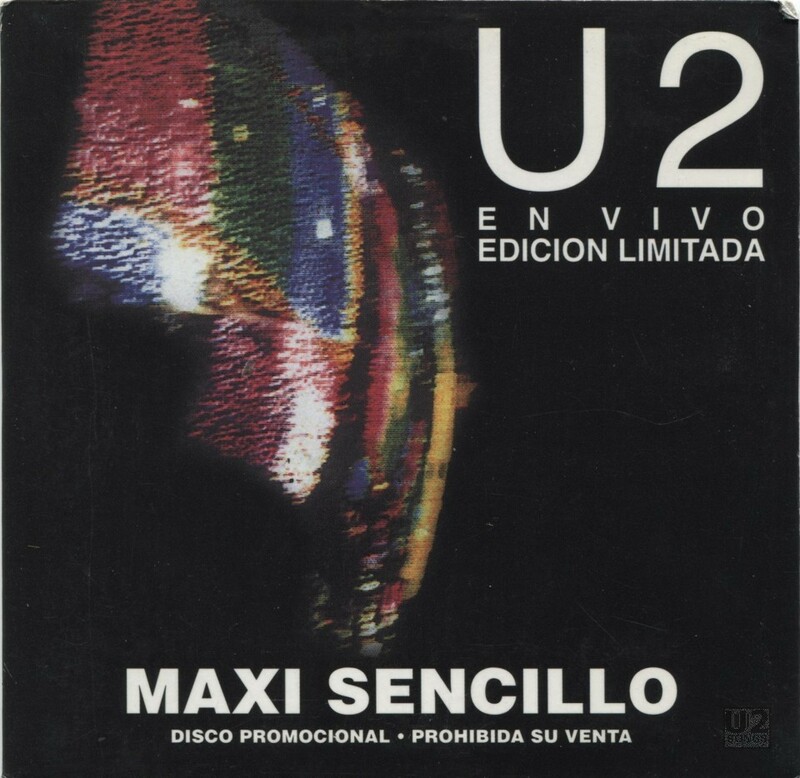 The full text on the front of the cover for this release is “U2 En Vivo Edicion Limitada” with a large “Maxi Sencillo” and then “Disco promocional – Prohibida Su Venta”. That translates roughly to “U2 Live Limited Edition” with “Maxi Single” and “Promotional Disc – Not for Sale”. Thus it is being cataloged here under the title “En Vivo”. The CD was released as a promotional disc in Columbia in the fall of 2000. The CD was included for sale with copies of the album “All That You Can’t Leave Behind” during the first week of sales at certain retailers in the Colombian market. “Pop Muzik” does not have the silence at the start of the track that is on the fan club release. It also has a long 23 second fade out of the track, and ends with 4 seconds of silence, where the fan club release goes right into the next track with no fade out. “Staring at the Sun” has a very quick fade in, fades out, and has 3s of silence at the end. The fan club release is continuous so these fades are not present. “Where the Streets Has No Name” has a slight silence added at the start, and fades in and fades out, with 4 additional seconds of silence at the end. “Lemon” fades in, and also adds 13 seconds of music from “Discotheque” at the end of the song, while it is fading out. This is part of the next track on Hasta La Vista Baby. “One” is the exact track from the fan club release, except for a fade in. The fade out happens at the same spot it does on the fan club release. The tracks are overall mixed lower in volume, and the overall peak for all five songs is 100% on Hasta La Vista Baby, but on this promo release the tracks are 89.0 – 99.9% for peak volume. The promotional CD is in a card sleeve, and the image on the front of the cover was also used on the “Hasta La Vista Baby” release. This CD was released in limited quantities. The promotional release was not sold separately from All That You Can’t Leave Behind and information on that release can be found under the entry for All That You Can’t Leave Behind in the discography. Sleeve designed by ABA, Dublin. Photography by Kevin Davies.